After Craig Breedlove’s record of 600.842mph had stood for nearly five years, Gary Gabelich aboard The Blue Flame, a 37 foot, three wheeler sled propelled by LNG (Liquid Natural Gas) and sponsored by the American Gas Association, (hence the name) broke Breedlove’s record with his own two way pass averaging 622.047mph on October 28, 1970. Ironically, Breedlove had been the Reaction Dynamics Inc. Company’s first choice but was turned down upon wanting to be paid too much. Drag racer Chuck Suba was the second choice, but perished in a drag racing accident, with Gabelich being the firm’s third choice. Gabelich; of Croatian descent, was apparently a glutton for speed and severed his hand in a drag racing accident, before having it reattached, which ultimately ended his racing career, prior to perishing in a motorcycle accident in 1984. As I’ve just learned recently, this most controversial rocket car was piloted by Stan Barrett, father of Stanton Barrett who Y’all recall contested the majority of the 2009 Indy Car championship for Team 3G. Interestingly, the project was put together to become the first vehicle to exceed the sound of speed on land, yet its December 17, 1979 single way run has been disputed ever since, as the USAF ground based radar inadvertently was tracking one of the teams support vehicles at 38mph instead. When the speed was later calculated at 739.666mph, there were many skeptics as no sonic boom was ever heard and the USAF is not a recognized agency for verifying land speed record attempts and thus, Gary Gabelich’s 1970 record remained the official recognized LSR. Interestingly, Richard Noble began his professional life as a paint salesman, but this proved a tad too slow for the Englishman, whom set out to build his very first LSR vehicle Thrust 1 in his own garage. The vehicle was a total wreck upon a crash during testing, when Noble flipped three times and then placed an “Advert” for a designer of a 650mph rocket car. The advertisement was met and John Ackroyd designed the Thrust 2, for which Noble secured a sum of $1.7m pounds sponsorship from a source of 200 British businesses. Despite a series of setbacks, including another crash, Noble finally achieved his goal of beating Gabelich’s LSR record, when he obtained a two way pass averaging 633.468mph on October 4, 1983 at the Black Rock Desert in Nevada. Having been asked to give a presentation to the Castrol board, who had sponsored his Thrust 2 project; Richard Noble was informed that Castrol would be more then willing to help fund his next project, ultimately known as the Thrust SSC, in deference to its quest to officially break the sound of speed on land. This behemoth, at 54 feet long and 12 feet wide, weighed a staggering 10.5 tons and was propelled by two Rolls Royce Spey 202 turbofan jet engines, used to power the F-4 Phantom II jet fighter. 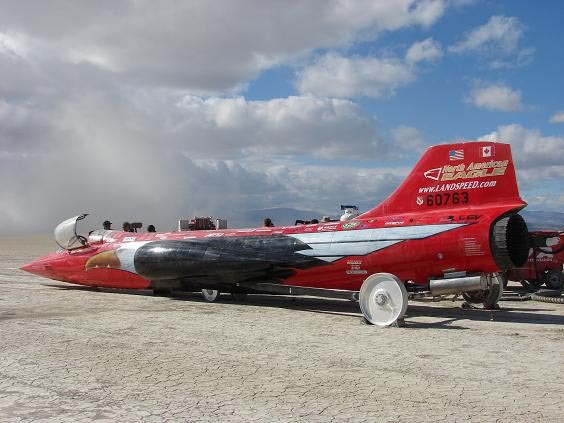 These engines were rated at 20,000lbs thrust apiece, while two even more powerful Spey 205 engines with a thrust rating of 25,000lbs apiece were used for the LSR attempt on the Black Rock Desert. Yet, looking back on it now, I’d say that Breedlove never had a BLOODY chance, as the Thrust SSC was amazingly engineered, taking some four years of research and development before actually tackling the record. And part of this dynamic challenge, besides the aerodynamics, of transitioning from subsonic to supersonic speed, included trying to figure out what would happen in this critical transonic range, as Computational Fluid Dynamics (CFD) was used to predict the vehicles aerodynamic shape. And the Thrust SSC certainly didn’t lack for horsepower, as the two Rolls Royce jet engines provided the horsepower of 1,000 Ford Escorts or 145 Formula 1 race cars, no, it was more a matter of keeping the beast projected in a straight line and also keeping it tethered to mother earth. For these unique requirements, two solutions evolved. The first being rear steering, as the packaging constraints physically didn’t allow for front wheel steering components, thus leading to the decision to use rear steer. To advert the fears of this most unusual steering arrangement, a vintage Mini Cooper was built to scale with the novel rear steering solution and tested at speeds of up to 90-100mph, in which it was learned that the vehicle stayed perfectly straight. For keeping the vehicles attitude perfectly aligned at all times, Jeremy Bliss was given the task of Systems Designer and utilized his Lotus F1 Active Suspension experience, from the days of the Lotus 99T, driven by Ayrton Senna and Nigel Mansell, which had since become banned, with Bliss developing this technology for the Thrust SSC. And Noble’s plan for eclipsing the sound barrier was a methodic approach as Green steadily worked up to speed, finally laying down a blistering run that shattered Nobles’ 14 year land speed record, by going an amazing 714mph on October 13, 1997. Yet like many attempts before, the supersonic attempt would take a little longer, as regulation require that the two way pass be completed with no longer then one hour between turnaround, of which the team wasn’t able to accomplish after having overshot the finish of the Thrust SSC’s first run. Ironically, once again there appears to be a possible rematch of Yanks vs. Brits in the desert, as there are currently two new projects in the works; the North American Eagle project and the Bloodhound SSC project. Yet the question remains: Do Y’all wanna see this type of futuristic Buck Rodgers-mobiles slicing their way around the venerable Brickyard? Or perhaps simply follow the trajectory of the modern day Gladiators from their annoyingly distracting array of coloured lights? Or should we simply progress forwards in incremental steps and continue the tradition of Open Wheel Racing into the 22nd Century? What Really Is the story behind Project Delta Wing?